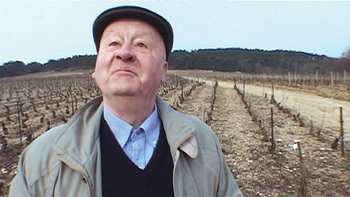 A Vine Madness: The patriarch of the de Montille family upholds the honor of French viticulture. FORTUNATELY, Jonathan Nossiter has already implied that his new film, Mondovino, is like a James Bond movie. I always worry about superimposing my degraded taste for 007 on a movie, but Nossiter's three-hour-plus documentary on the globalization of wine uses locations from the palms to the pines and boasts big maps, sinister laboratories and secretive millionaires hatching Dr. Evil schemes to grow wine grapes on the moon. Sean Connery, in tuxedo: "I won't asksh you so politely nexsht time. What is the meaning of 'Opus One?'" Bond never needed the Wine SPECTRE, excuse me, Wine Spectator, to guide him. Fans remember the time in Diamonds Are Forever when he unveiled a disguised assassin posing as a wine steward, using a trick question about claret as his weapon. Nossiter himself was a sommelier, with an inclination toward the classic method of wine production: the family-run estate, the cobwebbed cave and the ancient barrels, instead of cold steel vats and raw oak. He begins his film at small vineyards in the Pyrenees. There, the Napa-based Mondavi wine conglomerate (it was recently sold, though the movie doesn't mention that) was trying to purchase and level the top of a hill. Nossiter then travels with international wine consultant Michel Rolland, who has worked on four continents to standardize wine. Rolland, who works for large wine conglomerates, including Mondavi and Mouton-Rothschild, is endeavoring to do to wine what Budweiser did to beer. As a result of Rolland and those like him, Languedoc farmer Aime Guibert pronounces, "Wine is dead. Not just wine, but cheese and fruits." But in Mondovino's frame, no room exists between Alice Waters and Ronald McDonald, so to speak. Mondovino makes California winegrowers look like parvenus. Apparently, the interviewees expected neither the shaky camera nor the firm questions. Publicists get caught foolishly rhapsodizing about their bosses. And Napa winegrowers Shari and Garen Staglin are caught flaunting their estate and their expensive Robert Arneson and Viola Frey statuary. Nossiter opposes these Yankees with de Montille family in Burgundy. The old-fashioned de Montilles eloquently argue for terroir, the flavor of the land. They're opposed by a corporate winemaker's claim: What is aimed for today is not excellence, but perfection. Nossiter heads to Maryland to visit Robert Parker, the one critic who has done the most to shape the world's opinions on wine. Parker wears the rosette of the Legion of Honor on his lapel. But this self-described "ex-Maryland farm boy" denounces "the great selling job the French have done" on the superiority of their wine. Mondovino is at its meatiest concerning the coziness of the former Mondavi wine empire and Parker and the staff at the mag-of-record, Wine Spectator. Nossiter implies that the current craze for Tuscan wines has something to do with the fact that Mondavi was thwarted from expansion in the south of France. If you thought you were jonesing for a glass of pinot noir watching Sideways, imagine going three hours through this one dry. A glass or two might ease one's opinion of the director's doggie love. Every time a dog enters the picture, the camera wanders off after it. If only Nossiter had a leash you could tug on. The implicit argument that California has no cultureand thus no real terroirdeserves a spirited counterargument. Nossiter is right, however, that the wine industry always plays up to powerto Peron, Mussolini or Reagan. Still, hunting up collaborators in Italy and Argentina seems like ancient history. And a little something more on the farm hands would have been appropriate. It's always been brutal work. Part of what radicalized Karl Marx was seeing the suffering of the wine-growing peasants in Mosel in the Rhine in 1843. This is a film bound to cause blood, not wine, to flow. W. Blake Gray of the San Francisco Chronicle made an early strike, claiming that "the anti-globalization crowd will lap [Mondovino] up." That's one big crowd, whether the Chron's staff wants to hear them lapping or not. However, Gray is absolutely right to note that Nossiter doesn't delve into the matter of southern hemisphere wine-growing. The Australian wine industry hoses the world with low-cost merlot and chard, though this isn't as scary a thought as Robert Mondavi's claim that he would like to grow the ultimate high-altitude grapes: wine on Mars. Wherein Australia or Marsare they going to get the water? And in Northern California, how can you justify buying a bottle that burnt up who knows how much jet-fuel flying here when a few miles' journey takes you to some of the most fabled wine-growing regions in the world? Mondovino (PG-13; 135 min. ), a documentary by Jonathan Nossiter, opens Friday at selected theaters. From the April 6-12, 2005 issue of Metro, Silicon Valley's Weekly Newspaper.